We managed to wake up early that day to be on time for the market tour. It was great to see this enthusiastic group of 12 people, some from US, some from Malaysia, Israel, Germany, Australia - all interested in cooking Catalan. Our beautiful teachers, Alexia and Anna, introduced themselves, took their large shopping bags and we started off to La Boqueria. At 10 a.m. the market was already getting busy. Alexia stopped for a moment in front of the market map. She explained that though it might seem that La Boqueria is a mess, the truth is that it is very well organized. Inner circle is seafood, outer circle is fish, fruits and veggies are mostly on the right, meat is at the back on the left etc. There are also several very nice tapas bars around La Boqueria. The most famous seems to be Pintxo, but we didn't get to visit it this time. We had quite some walk around the market, buying ingredients for our cooking. Alexia was guiding us and telling lots of interesting stories. Smoked paprika is often used in Catalan cooking, especially soups and stews. Saffron treads we obviously needed for the paella. 1 gram = 4.5 euros or so. This stand has all the eggs one could possibly imagine. Yes, I wanted to touch this huge black one. At least I'm not the only one who did. Zucchini flowers. Look smaller than those we had at Cañete tapas bar. In front of the Jamón we stopped for good 5-10 minutes. Alexia told us a lot about how the one worth 35 euros per kilo is different from the one worth 176 euros. 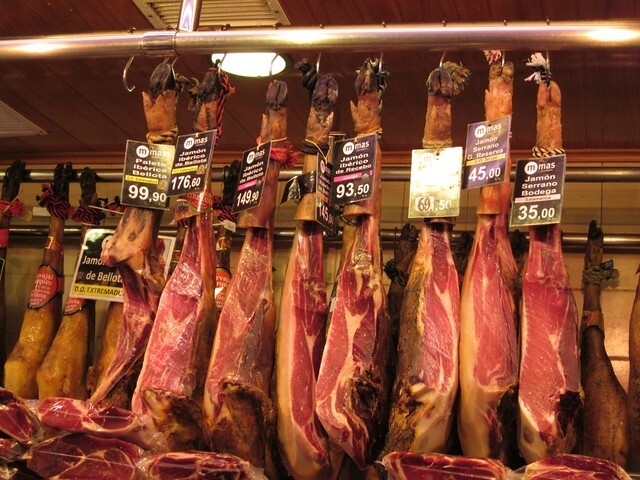 Majority of Jamón is produced from the meat of certain breeds of white pig (Jamón serrano). The most valued Jamón is made of black Iberian pig's meat (Jamón ibérico) and is more expensive. The quality of Jamón depends first of all on how the pig was raised (the feed and phisical activity make a difference). It also depends on how the meat was cured and for how long (should not be less than 2 - 3 years). The leg is larger and historically more popular. However the shoulder (paleta) also gets prepared in the same manner and produces delicious cured ham. Anna said she actually prefers the shoulder. After that we went back to the cook&taste studio for a marvelous Catalan cooking class, where we made gazpacho, tortilla, paella and crema catalana. Such a fantatsic place.I loev amrkets.Actualy on one groupsblog I had a series of markets from all around teh world called:market day in..